This weekend the cherries on my sister-in-law’s two cherry trees – one black and one sour – were ripe for picking. The weekend was also the date of our annual pantagruelesque picnic on Les Chaumes, and one of my jobs was to bring dessert. Put these two events together, and what do you get? 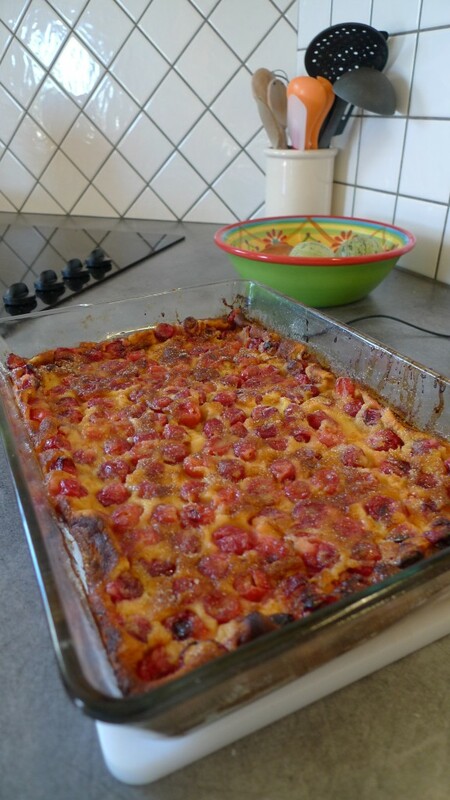 A delicious homemade clafoutis. Steph lent me her favorite recipe, and besides being as easy as falling off a log (if you click on my “favorite recipies” tag, you will note this is a common denominator!) it consists of ingredients you can find just as easily in North America or Britain as in France. So…êtes-vous prêts de Clafoutis aussi? – Melt 30 grams of the butter in microwave or small casserole. Set aside. – Mix eggs together in medium sized bowl with fork. Add the salt, sugar and mix well. – Pour in flour and mix again until there are no “lumps’ left. – Add the 30 grams of melted butter and the milk. Mix again until smooth. 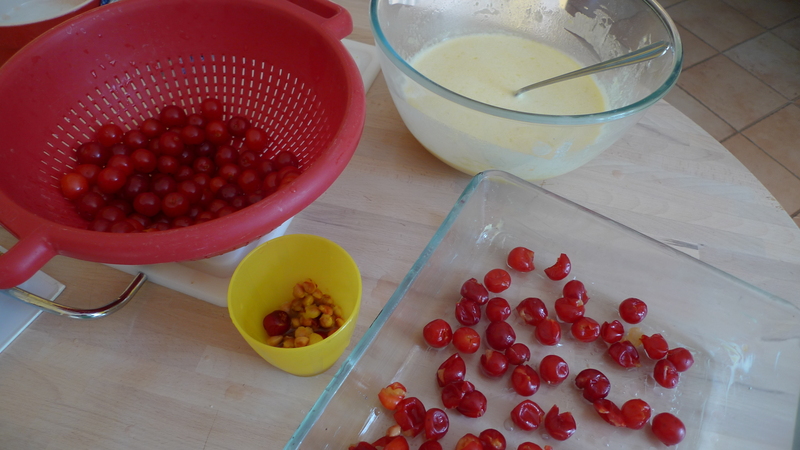 – Wash and remove the pits from the cherries (I do this, although Franck’s gradmother was firmly rooted in the “do not remove the pits’ camp – just be careful of your fillings!) and spread evenly on a well-buttered 9 x 13 baking dish (glass or porcelein preferable). – Pour the liquid mixture over the cherries and then dot with the rest of the butter. 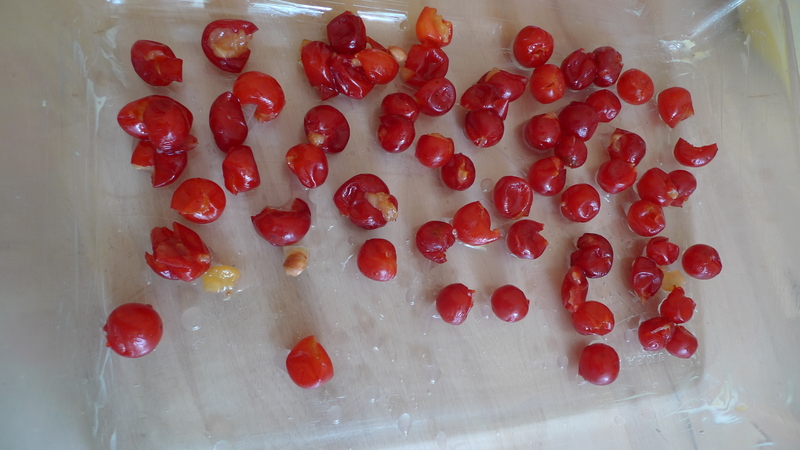 – Put in a 220 degree Celsius oven for around 35-45 minutes, keeping an eye on it that it doesn’t start to burn. – When you remove it from oven, sprinkle with package of vanilla sugar if available. Serve at room temperature. This entry was posted in Favorite Recipes, Uncategorized on July 9, 2010 by admin. Thanks for the recipe! Will definitely try it. I had the most wonderful apricot claufoutis when I lived with a family in Avignon, and I’ve never been able to recreate it. Maybe this will do the trick!